Finding an identifying sound is hard enough for most artists that once they’ve established their comfort zone, they throw themselves into it and stay there. Not so for English trio Band of Skulls: The indie rock group “went back to square one” on their latest record, reevaluating themselves and making a conscious attempt to try new things. Heavy blues-rock influences traditionally characterized Band of Skulls’ music, but if you find it hard to pin down their genre at this point, you’re not alone. 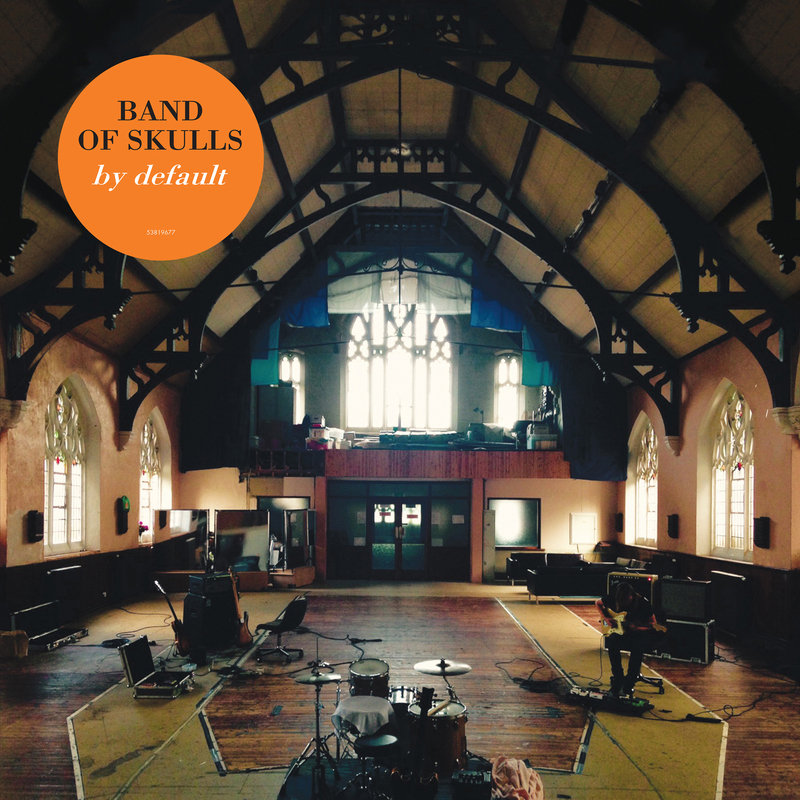 The band’s fourth album, By Default (released 5/27/2016 via BMG) finds Band of Skulls consolidating a plethora of styles and influences into a collection of sharp and explorative songs, a strategy that ultimately results in a fresh, harder rock sound that sets Band of Skulls apart from their modern rock peers. Heavy; light; dance-y; overdriven; By Default has something for everyone, but it maintains a consistently high energy throughout. Riff-based rockers like “Killer” and “Embers” take advantage of dissonance and dynamic juxtaposition to fuel their fires, whereas the darker “Erounds” and standout track “So Good” employ forward-driving dance beats to keep listeners engaged and on their feet. A mindfulness toward melody is present from album opener “Black Magic” to closer “Something,” but melody serves different purposes in these contrasting songs. In a successful attempt to turn listeners’ heads and engage us early on, “Black Magic” features a catchy singalong chorus that can all too easily get stuck in our heads. Meanwhile, “Something” closes off By Default in a somber, more mellow tone. Singer Russell Marsden’s deft vocal lines are complex, flowing up and down in perfect synchrony with singer/bassist Emma Richardson’s bass. “Something” is a lullaby and a drone, and as such its melodies are calming and drawn out. On basis of description alone, By Default must sound like a record that is all over the place – a little dancing here, a little hard rock there. Such is not the case: The record is extraordinarily cohesive, as Band of Skulls retain a trademark sound throughout. It’s a testament to the variety of music that can come from different configurations of the same instruments. One must commend the guitarist who knows when to play rhythm, when to play lead, and when to be a true background noise: The band’s maturity is highly evident in the way each member approaches his or her respective instrument(s). Such creativity also leads one to wonder how Band of Skulls, who for seven years now have crafted music with guitar, drums, bass, and vocals, might take their music to another level by incorporating more outside instruments. There’s hints of additional instrumentation in By Default here and there, an exciting change in the band’s narrative to-date that promises more experimentation to come. With By Default, Band of Skulls succeed at creating a diverse stadium-sized record that packs a serious punch. Every song has character and charisma: From the infectious, throbbing rhythm of “So Good” to the staccato riffs of “Bodies,” Band of Skulls’ tenacious energy is alluringly ever-present. If this record was their “back to basics” moment, they attacked it headfirst and gave the music their all. Atwood Magazine spoke with Band of Skulls’ Emma Richardson to dig deeper into the context and headspace that led to By Default. What resulted is an eye-opening look into a band on the precipice of change, taking the reins as they dare to evolve their music and themselves. Get to know Band of Skulls through our exclusive interview, and go listen to By Default, the band’s fourth album, out now! 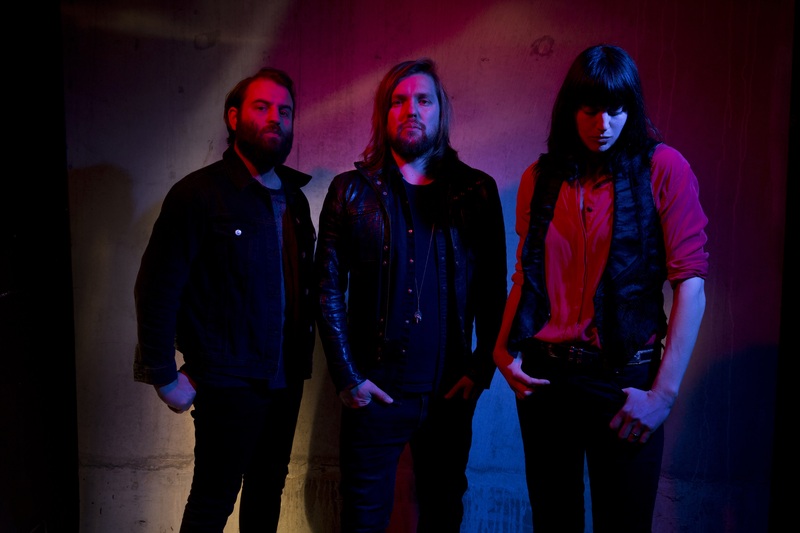 Atwood Magazine: Hey Band of Skulls, thanks so much for your time! Let’s dig right into it: It’s been over two years since Himalayan was released, meaning even longer since the recording sessions for that album. How have you developed musically over that time? Emma Richardson: It was a pretty relentless schedule for the first three records. As soon as we finished writing and recording each record we went straight back out on the road and played as many shows as we could. It felt like the right time to take a moment and think about our plan of attack for the fourth record. You learn a lot working with different people and playing so many shows and your musical influences expand and you change as a person ’cause that’s life, so it all goes into the next body of work you make. Matt is quoted as saying “We went back to square one” on this record. What does that mean? Emma Richardson: We hired a new space, a church in the centre of our home town and stripped down our equipment to the bare minimum and started playing brand new ideas to each other. It was really refreshing to work in an unknown space and see what it brought to the writing process. The acoustics in the church were amazing and really inspired us. We were using the room and playing off it and it ended up influencing the sound of the record. I have to get something off my chest before we go any further: By Default is actually my introduction to Band of Skulls’ music. It’s a different experience when you get to know a band by their most recent effort, and then travel back in time with them to previous works. What I’m finding with this new record is that it takes your sounds and builds upon them – making it recognizable and characteristically “Band of Skulls,” but equally fresh and exciting. What did you find were some of your influences going into the sessions? Emma Richardson: We wanted to explore other influences and ways of writing and working together. We are really proud of our first three records and we want to continue pushing what we are capable of as band. We all write and play on different instruments and listen to a lot of different music, so it’s a real buzz when we come together and an idea that is rooted in, for example dance or electronic music, is then put through the filter of our three-piece band – it opens doors to other possibilities. How do you typically write songs? Is there a “typical” fashion for you – and did it change at all with this record? Emma Richardson: We all bring in ideas, riffs, melodies, lyrics and play them to each other. Some ideas fit together easily some need more work than others, some take on a whole new life. It’s an instinctive thing that we’ve honed over time. We fight for our ideas and they get put through their paces so the finished songs are the best they can be. This record feels tighter than the rest. Do you get that sense as well? Was it a conscious effort on the band’s part? Emma Richardson: We wanted to strip away anything that felt unnecessary and it was a conscious focusing up of the material yes. We worked with Gil Norton [Pixies, Patti Smith] for the first time and he had a different way of working, so we spent a lot of time in pre production going through the material making sure we were all happy and so it naturally felt more concise. People call your music “indie rock,” but I admittedly have no clue what that means. How do you define your music? Emma Richardson: We get quite a lot of different labels, indie, rock, alternative, stoner, garage, blues, pop, I think that’s a great thing, to be hard to pin down. We all like a lot of different styles of music and because there are three different songwriters the music we make isn’t always going to sound one specific way. On every record we’ve released I think that shows. So By Default is “square one” for the band. How does a band start from scratch? Emma Richardson: For this album it was about stripping away all the equipment we were using on tour and playing on the smallest set up and singing up to the church roof and using that as the starting point so the songs and the material were the focus. It’s always the challenge, how to best utilise all the elements in our band, the guitar, bass and drums and the two vocals in the best way possible and make it new and exciting for ourselves and not repeat what we have already done. Did you seek inspiration in new things? Did you force yourself to write songs differently than before? Emma Richardson: Yes. Always. Change it up, try a new way of working or a new instrument or a new environment. I think if you are open to it, inspiration comes all the time in many different forms. And the more you write or think about song ideas the more you come up with. Sometimes the best part of the process is when someone sees something that could happen in a song that another of us didn’t expect and it really adds to the song and the creative process in general. Tell me about the relationship between music and lyrics in Band of Skulls’ music. Emma Richardson: It’s very intuitive. Sometimes the lyrics come at the same time as the music, sometimes it’s a case of writing to a composition. Or the lyric idea is there first and that inspires the music. It depends on the song. It has to strike a chord, make you feel something or conjure some sort of imagery or make you think. It’s whatever is best for the song. How does melody factor into your music? Emma Richardson: It’s very important whether through an instrument or with vocals or harmonies. We’re always searching for the next melody, the next ear worm. If you had to describe your sound in three words, could you do it? Album openers are such critical introductions to records, and “Black Magic” certainly does justice, I think, in (re)introducing Band of Skulls. Why that song, though? What is it about “Black Magic” that led to it being placed first? Emma Richardson: It felt right as it was one of the first ideas of the writing session and it went through a lot of changes to get to its final version. And it has a great dance floor announcement with the snare roll at the top. It has all the elements of our band on show and we thought it was the best way to start with this new collection of songs. What was the last song you recorded for this record, and do you think it’s different from the first song you wrote for the record? Do you feel like you grew (as a band, musically) over the period of time you were recording? Emma Richardson: I remember when we were singing on “Killer” near the end of the session and then “Erounds” and “So Good” and “In Love By Default” and thinking what a diverse record it was gonna be, because [of] all of these different styles and moods. And from beginning to end it really does grab you and take you on this adventure. We got to work with the very talented Gil Norton for the first time and we learnt a lot about our process, what we are capable of and about his process and how he makes records and gets sounds, and you keep that knowledge and take it with you and use it and move on up. Is “starting over” something you would recommend other bands do as well, and do you think you’ll opt for a similar approach on LP 5 (whenever and whatever that may be)? Emma Richardson: Every band is different. You have to do what works best for you at that particular time and for us was finding a new working environment and bringing fresh ideas and ways of working to the table. We will probably change it up again for the next record. We are already thinking about it. Which song are you most proud of on By Default, and why? Emma Richardson: We are proud of every single song on this record. A lot of work went into writing and recording them and we are so happy to be able to now play them out live and have the physical vinyl in our hands and know it’s out there in the world for people to listen to. To me, “So Good” really stands out as a song that’s got everything: A driving beat, a catchy melody, a riff that seems to involve all members. What are your favorite songs – do you share a common one, or each have something different for this record? Emma Richardson: We love them all equally! Now we are getting to add them all to the live set and it’s amazing to see the crowd reacting to the new material as much as the old. What was the hardest song to make – not musically, but emotionally? Do you struggle ever to make yourselves so vulnerable in song? Emma Richardson: I don’t think it’s something you plan; it just happens that way. The very fact that you create something that starts off very personal and private and then it goes out into the world for all to hear and pick apart is always quite daunting but equally exhilarating. You can’t think of that final release and all that goes with it when you’re writing; it’s more about whether initially it’s a good idea or not, and if it’s got something and then if it gets through the process, and it’s still how you intended and keeps that feeling you had about it in the beginning, then it’s a winner. 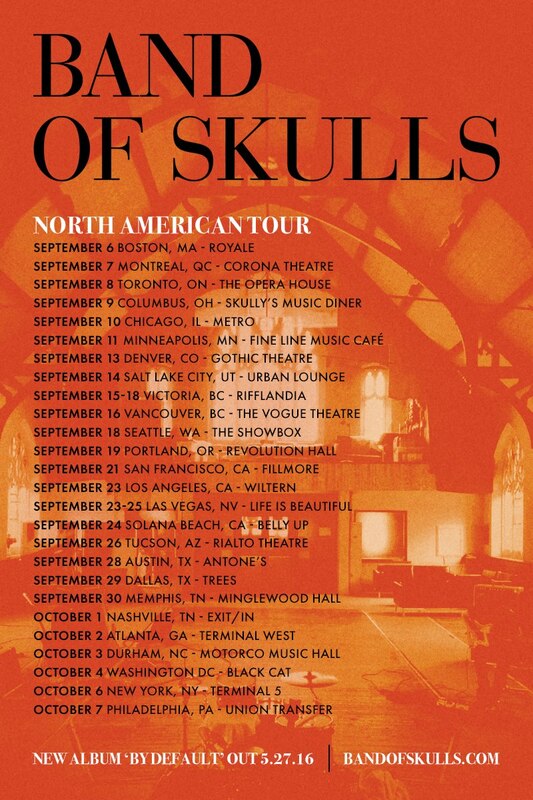 I’ve always wanted to know – why Band of Skulls? Does that name continue to represent the group’s musical mentality? Did it mean anything to start? Emma Richardson: It’s always meant us three and our collective skulls getting together and making music and plotting! Thank you all so much for your time! Last question: What’s on tap for Band of Skulls next? Another two years of nearly nonstop touring? Emma Richardson: We will definitely be out on the road, yes. We are coming to America for a full tour in the fall and we want to get round the world and play in as many countries and to as many people as possible and then we will get on and make the next one!